For Yuval Wagner, a former IAF pilot who survived a helicopter crash and founded Access Israel, the sky’s the limit. 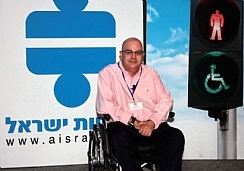 Yuval Wagner’s eyes dance when he talks about Access Israel, the nonprofit organization he founded in 1999 to promote accessibility for Israelis with disabilities. During an interview at his home in Hod Hasharon, he voices the hope that Israel will become a world leader in the field of “digital accessibility.” Before he explains why, Wagner, 51, shares his own miraculous story. Although he smiles as he talks, his eyes well up with emotion. “I grew up with a father in a wheelchair, a disabled IDF veteran who was wounded just after Operation Kadesh [the Sinai Campaign in 1956] in a country that was not accessible to people with disabilities,” says Wagner, sitting in his own wheelchair. Twenty years after being wounded, Danny Wagner, Yuval’s father, was stationed with his family in the US, where he encountered people with disabilities flying planes. When he returned home, he completed a flight course and became the first disabled pilot in Israel. In 1983, Yuval was accepted for the flight academy in the Israel Air Force, and he concluded his service as a combat helicopter pilot three years later. On March 18, 1987, during a training exercise over the Jordan Valley, south of Beit She’an, he was involved in a helicopter crash that almost cost him his life. The crash, which occurred in an orchard near Kibbutz Tirat Zvi, left Wagner with a spinal injury that paralyzed him from the neck down. After being hospitalized for three weeks at Hadassah-University Medical Center in Ein Kerem, he began an eight-month rehabilitation at Tel Hashomer. Fortunately, he says, the IAF approached him and asked him to stay on and continue his service in some other capacity. He agreed. During his military service, he completed a degree in business administration and information technology, specializing in marketing, and got married and had three children. His two oldest, a daughter, aged 23, and a son, aged 22, both served in the IAF, and the third, aged 19, has just started her service in the air force. After getting married and having three children, the issue of accessibility became increasingly annoying to Wagner, until he decided to take action 17 years ago. Wagner wrote a letter to then-president Ezer Weizman, saying he could not teach his young children the value of fighting for a country he loved, because the country was not accessible to people with disabilities. “How can I teach them to love Israel like I do?” he wrote. Two days later, Weizman was on the phone. After receiving approval from the IAF, Wagner gathered experts and friends from all fields as founders, followed Weizman’s order and established Access Israel. He serves as the organization’s founder and president. Some 18% of Israel’s population has some form of disability, according to the Central Bureau of Statistics. Access Israel was the first and only NGO in Israel focused and dedicated to making the country accessible for everyone with disabilities. Its mission, according to Wagner, is “to make Israel a place where people with disabilities are integrated into society with dignity, respect, equal rights and a high level of independence. Over the years, he says, the organization has achieved significant success in making Israel accessible, advancing relevant legislation and raising public awareness. Next year, Access Israel plans to host some 700 people at a hotel in Tel Aviv, with the conference highlighting technology and accessibility. Digital accessibility enables all people, including those with disabilities, to access electronic devices, mobile applications and websites. Most global corporations “get this and are there already,” Wagner says. Sponsored by the Foreign Ministry, representatives of Access Israel attended the Habitat III UN Conference on Housing and Sustainable Urban Development to discuss urban accessibility. “An incredible thing has happened. Suddenly, people understand that an NGO like Access Israel is a wonderful way to improve Israel’s international image. It’s a kind of Zionism. So, for example, at Habitat III we hosted “a dinner of the senses,” which raises awareness of disabilities without being political,” Wagner says. On November 1, Access Israel is holding its first-ever donor campaign event at Tel Aviv University, which will feature a host of Israeli entertainers (Details can be found on its website, www.aisrael.org). On November 21, it is hosting a high-level conference on technology and accessibility, together with Bank Hapoalim, aimed at CEOs, entrepreneurs and top business people. Wagner won the Globes’ Social Entrepreneurial Award in 2006, and a Rick Hansen Foundation Difference Maker Award in 2011. Asked if he had personally achieved some kind of closure since his helicopter accident, Wagner says: “I decided 17 years ago to make accessibility my life’s mission. Today, I am totally dedicated to conclude this mission. We enabled people with disabilities to vote in elections, and we are now working on legislation to allow blind people to vote by themselves, and not with the aid of an assistant. “When I was injured, I felt that I was not only disabled but sentenced to house arrest. The true test today is creating a normal life for people with disabilities, allowing us to do all the things that normal people do. People talk about equality and it sounds like a slogan. But ultimately, it all starts with awareness,” he says.